DRAWINGS BY THE AMERICAN PAINTER Washington Allston (1779–1843) in the collection of The Washington Allston Trust, on deposit at the Fogg Art Museum, Harvard University, have recently undergone conservation treatment at the Center for Conservation and Technical Studies, Fogg Art Museum. The treatment of a group of four tracings (8.1955.151; 152; 153; 154) depicting the main figure groups in Allston's painting Jacob's Dream, 1817, (The National Trust, England), presented special problems. 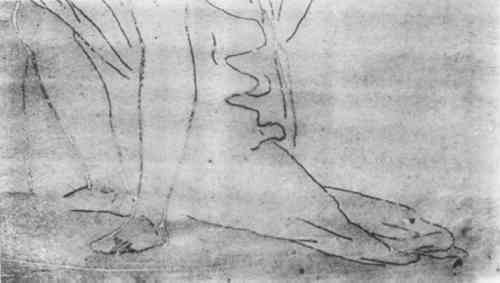 These tracings were made by Allston from his original painting to preserve a record of this major work which he had left behind in England.1 The tracing paper on which the figures are outlined may have been made by the artist himself by painting thin, strong, wove paper with a homogenous oily or resinous substance to make it transparent: sesame, walnut, almond, cotton, and other oils; turpentine; alcoholic solutions of sandarac or mastic; or oily solutions of wax or resin have been mentioned in the literature as suitable for this purpose.2 The four sheets are of similar dimensions ranging from 22½ to 24½ inches by 17¾ to 17⅞ inches. All bear the same watermark, the initials CS over intertwined branches, which further suggests that they form a related group.3 Unfortunately it was not possible to identify this paper further by locating this watermark in the standard references. These tracings appear to have been much handled, perhaps from the beginning. Traces of red sealing wax adhering to several corners, pin holes either scattered around the edges or grouped at the corners, and random streaks of pigment powder remaining on the sheets suggest that the tracings may have hung for a time on the walls of Allston's studio. When received for the treatments described in this paper, the tracings were attached by irregularly spaced gummed paper hinges and daubs of glue to either window mats or backing cardboards. Since the paper is very responsive to changes in humidity, being held under tension by the paper tabs produced draws from the corners to the center of each sheet and cockles running parallel to all inside edges of the window mat. 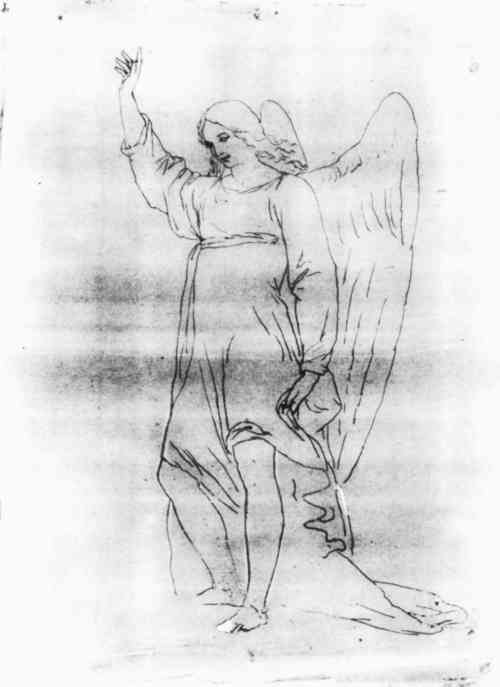 Evidence that these works have long suffered from severe wrinkles, creases, buckles, and torn, folded and abraded edges is provided by a reproduction of the tracing, Two Groups of Angels, (8.1955.153), in this condition in a publication of 1892.4 In color all the tracings are now mostly darkish brown. Lighter areas remaining around edges previously covered by mats suggest that the paper has darkened. It has also become extremely brittle because of the oxidation of the substances used to make the paper transparent. The outlines were traced by pen in iron gall ink. Later, they were indented with a stylus, probably when these drawings were used as the basis for engravings published in 1850.5 With time, the highly acidic ink medium has weakened the paper, and in two of the tracings, the lines have begun to disintegrate, leaving a lacework of gaps to mark their former positions. BECAUSE IT WAS NECESSARY to consolidate the embrittled tracing paper and to preserve what remained of the fragile pen and ink lines, it was decided to line the tracings. The use of aqueous adhesives had to be rejected. Not only is tracing paper usually reactive and expansive when wetted, but in this case any attempt to moisten the sheets would cause the delicate lines to fall away completely. Therefore, a solution to the problem, previously described for mounting deteriorated textiles, was adapted and a heat-seal adhesive, poly (vinyl acetate) PVA, was chosen.6 This material is well documented and has an excellent aging record.7 Its use as an adhesive is straightforward and efficient. It is also reversible since bonding takes place as the result of the PVA adhering to not impregnating, the paper fibers.8 Because the resin is available in several viscosity grades, one with a relatively low softening point in relation to the other heat-seal adhesives was considered the best in this case. Excessive heat would cause further deterioration of the fragile tracings. The lining material chosen, Cerex Spunbonded Nylon Gossamer Web, was both lightweight and transparent enough to preserve the thinness and translucency typical of tracing paper.9 Flexibility of the lining would be provided by spraying the adhesive, thereby preventing the stiffening that would result if the web were filled with resin as by brushing.10 In this way, it was hoped to retain the stylus indentations and the wrinkled, undulating surface topography which give these sheets their particular character. AFTER COMPLETION of the initial examination and photographic documentation, the drawings were detached from their mounts by slitting through the top layers of the old wood pulp core mats beneath each gummed paper tab. Separation between tab and mat was considered too risky to the brittle, disintegrating edge of the tracing paper because it involved contact between the edge and the metal spatula. Then the tabs were removed from the tracing paper using methyl cellulose poultices applied with a fine sable brush.11 Excess adhesive remaining on the support was picked up onto slightly damp clean swabs. All areas thus dampened were immediately pressed and left to dry under weights. Folded edges were lightly moistened along the fold lines. When the paper fibers had relaxed sufficiently they were unfolded and immediately pressed until dry. THE LINING FABRIC was cut to the required size and stapled to a strainer. A solution of poly (vinyl acetate) PVA/AYAF 10% in toluene to which a small fraction of diacetone alcohol was added to retard evaporation was sprayed onto one side of the lining with a spray gun set at a pressure of thirty pounds per square inch. The spraying was repeated several times, each application being followed by a period sufficient for drying, until a film, as thin as possible, yet adequate for bonding, coated the fibers. The lining, still attached to the strainer, was set aside for several days to allow most of the toluene to evaporate from the film. Fig. 1a. Washington Allston, Angel (Washington Allston Trust, on deposit at the Fogg Art Museum, 8.1955.151), iron-gall ink on tracing paper, before treatment. When the lining was removed from the strainer it was trimmed to measure approximately two inches larger on all four sides than the drawing to be lined. A clean blotter was used to pad a hard flat surface and on this a piece of silicone release paper was placed. Both these sheets were larger in size than the lining. The coated lining was put down, film side up, on the release paper and on this the tracing was centered face up. Another sheet of silicone release paper was placed on top to complete the sandwich. THREE METHODS OF HEAT SEALING the linings to the tracings were tested. A tacking iron was heated and stabilized at 150°F The tracing, held within the sandwich previously described, was carefully heat-sealed by hand pressure to the web lining beginning at the center of the sheet and working outwards in a series of deliberately expanding concentric circles—a tedious process with a large drawing, but simple and efficient with a tiny one. A dry mounting press was also tried. The use of this type of press limits the size of drawings which can be treated—the press available for our use had a base plate of 18 by 15 inches. 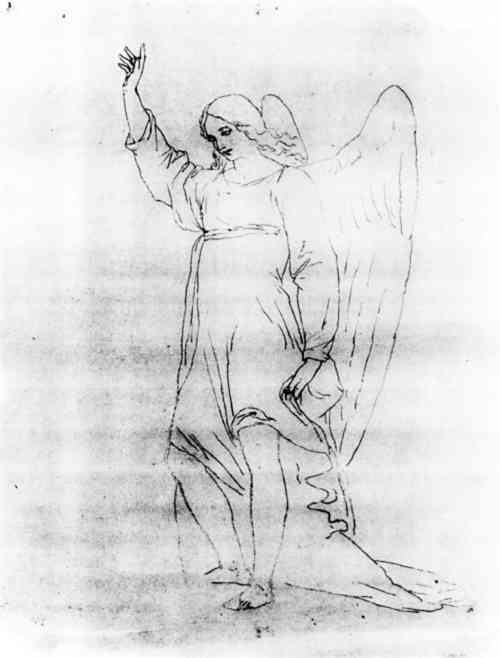 Since the tracings of Jacob's Dream were all substantially larger than this, another tracing in iron gall ink by Allston (Fogg Art Museum, 8.1955.155) which records the composition of his monumental painting Uriel and which measures only 9⅞ by 9 7/16; inches, was chosen for lining. The sandwich structure placed in the press varied only slightly from that described above: a blotter was placed on top of the upper sheet of silicone release paper to provide a resilient insulation from the heated upper plate. The press used included a felt-covered base plate which increased the resiliency of the setup. To seal the lining to the tracing the heated upper plate was lowered and the tracing was held under pressure at 150°F for 40 seconds. Tests had showed that a shorter time would result in incomplete bonding. 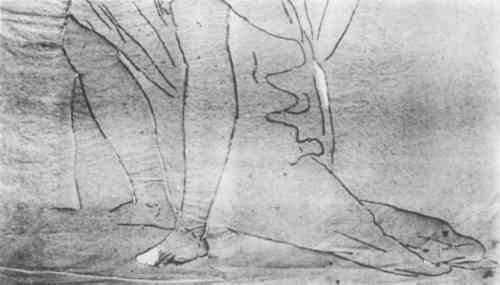 Three of the large Jacob's Dream tracings were heat-sealed to linings on a vacuum hot table. The sandwich described for case 1 was covered with a rubber diaphragm, the table heated to 150°F and evacuated to a pressure of 300 mm Hg. It was then cooled quickly under vacuum pressure. When using the hot table it is important to test for the exact amount of pressure required for the particular results desired. Too little pressure resulted in inadequate bonding of the lining to the tracing paper. Too much pressure would have produced flat, creased tracings rather than preserving the buckles and wrinkles which were felt to be characteristic. The problem of excessive pressure is most acute with the hot table since the object is subjected to both heat and pressure for a longer time than with either the tacking iron or the dry mounting press. With careful preliminary testing, however, this method provides the most efficient method of lining either large sized or numerous works. ALL THREE METHODS of heat-sealing these linings resulted in complete bonding to the tracing paper. The gossamer web adhered precisely and perfectly to the undulating contours of the sheets. Even the concave profiles of the remaining stylus impressed pen and ink lines were preserved on the front of the tracings. The web adhered so sensitively to their convex contours on the reverse sides of the sheets that these contours are still apparent when the reverse is examined in raking light. Further-more, the works retain the fragile, lightweight, translucent qualities typical of tracings, and the linings are invisible from the front and nearly so on the back of the sheets. All the linings are completely reversible since the poly (vinyl acetate) film bonds to but does not impregnate the primary support and may be separated mechanically12 or on the hot table from the fragile tracings. Upon removal, the PVA adhesive is retained on the lining web, leaving the paper relatively free of adhesive. These tracings may now be handled with ease and safety by curators and scholars. Fig. 1b. Detail of Washington Allston, Angel, before treatment. Fig. 2b. Detail of Washington Allston, Angel, after treatment. Fig. 2a. Washington Allston, Angel, after treatment. THIS TYPE OF LINING may be applied most successfully to thin, lightweight paper supports or to small, heavier ones. For example, it was used successfully on a small 16th century Italian double-sided drawing of Saint John the Baptist and Bishop Saint (Fogg Art Museum, 1965.428). The iron gall ink medium with which it was executed had so corroded the paper support that it had begun to split in several places along the drawing lines. A substantial heavily-inked area of the bishop's robe had fallen away in fragments, a few of which remained loose within the mat envelope, the others having already disappeared. Non-aqueous lining of this tiny drawing was effected using a tacking iron and the procedure previously described. When completed, the lining was unnoticeable from the front since it left the texture of the original paper unchanged. The other drawing, on the reverse of the sheet, was rendered only slightly less visible than it had been initially—seen as though through a slight, uneven haze. I WOULD LIKE TO THANK Marjorie B. Cohn for suggesting this project and for her interest and helpfulness throughout its execution. 1. Theodore E. Stebbins, Jr., “The Drawings of Washington Allston,” A Man of Genius: The Art of Washington Allston (1779–1843), Museum of Fine Arts, Boston, 1979, p. 239. 2. Christine Steinkellner, “Transparentpapier, I,” Maltechnik/Restauro, 1, 1979, p. 9. 3. Compare Stebbins, Ibid., p. 240, who is wary of attributing all tracings to Allston. 4. Jared B. Flagg, The Life and Letters of Washington Allston, New York, Charles Scribners's Sons, 1892, opposite 132. 5. Stebbins, Ibid., p. 239. 6. P. Himmelstein and B. Applebaum, “The Use of Sprayed Polyvinyl Acetate Resin Mixtures in the Mounting of Deteriorated Textiles,” AIC Preprints of the annual meeting at Dearborn, Michigan, 1976, pp. 57–65. 7. B. Rabin, “A Poly (vinyl acetate) Heat-Seal Adhesive for Lining,” International Institute for Conservation, Lisbon Congress, 1972, p. 631. 8. G. Berger, “On Hot Melt, Heat-Seal and Hot-Set Adhesives,” Journal of the American Institute for Conservation, 18, 1978, p. 44. 9. Cerex Spunbonded Nylon, 0.4g/yd.2, obtained from Conservation Materials, Ltd. 340 Freeport Blvd., Sparks, NV 89431. 10. Himmelstein and Applebaum, Ibid., p. 63. 11. 1:60, methyl cellulose and deionized water. Methyl cellulose obtained from Sierra Conservation Supplies, P.O. Box 339, Nevada City, CA 95959. 12. Mechanical removal, while theoretically possible, should not be attempted on very fragile objects because of the danger of damaging the support and in this case the medium.